2012 marks a major milestone for MD Manufacturing: we are celebrating our 50th anniversary. Fifty years ago Charles Emdy had a dream. He wanted to do something that would not only provide for his family but would better society. Despite his limited education, Emdy launched his company out of a nondescript garage in North Hollywood, California. In the ensuing decades, Emdy's dream became reality. MD Manufacturing would grow into the company it is today, with not only a worldwide distribution but an incredible network of dealers, without whom we could never meet the needs of our customers. In an unstable economy where businesses come and go so quickly, we are aware that this is no small milestone. We are humbled as we look back at the journey we have taken. At the same time, we realize how profoundly indebted we are to our loyal dealers. We could not have reached this important milestone without their commitment to the company. So we are honored to celebrate this anniversary with them. We want to thank them for their years of service representing not only MD's products but — most importantly — MD's commitment to family and faith, principles that form the bedrock of our company's core values. Because we know they share our belief that companies built on enduring principles are bound to endure, we look forward to serving customers for the next 50 years and beyond. "50th Anniversary" Decal will adorn a limited number of SilentMaster units. 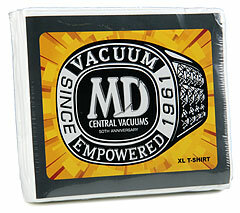 Free Vacuum-packed T-shirt with 50th design (for dealers). A $2500 Educational Scholarship awarded in honor of our founder's entrepreneurial spirit.